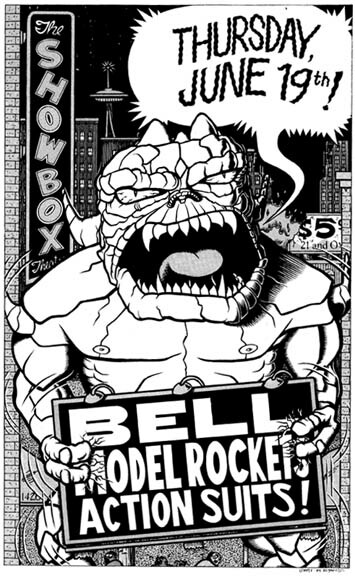 Illustration for a silkscreened poster for a bill at Seattle's Showbox in 1997 featuring the Action Suits, Model Rockets and Bell, all local bands. Illustration is on 14" x 17" board, in ink and zipatone. The price is so high because this has somewhat sentimental value and only some serious $$$$ will ice the love in my veins. <p> If interested, I also have a limited number of posters still available from this illustration, in b&w with red printing (mostly the monster and some lettering). Email me for a digital pic so you can see it, the price is $50 each.